When I went to my Rheumatologist for muscle pain, she told me the food is an important factor for controlling pain, but continued that since we are following the diet similar to Mediterranean it is really healthy so continue on that diet. Yes Indian cuisine is similar to Mediterranean in the use of lentils, beans etc. I am fascinated by Mediterranean cuisines as it uses spice like olive oil, olives itself. We usually shop at a Middle Eastern specialty store in Houston during alternative weekend. I always buy their bread, salads and sweets. I am amazed by the collection of beans, and there are quite a few beans such as white kidney beans/cannellini beans and fava beans that I had never heard of while growing up. As my hubby is diabetic we eat salad a lot, every day we try different kinds of salad. I made this Fasulye Piyazi, Turkish bean salad with vegetables and California Ripe Olives yesterday. Fasulye Piyazi is made with vegetables and olives and dressing to go with made from sumac-cayenne-cumin- chili dressing. Yes sumac, cayenne, cumin and hot chili pepper are common spices used in Turkish cuisine. I don’t like to use canned beans, so soaked white kidney beans overnight, and the next morning I cooked them in pressure cook for about 20 minutes (that is easiest way of cooking beans). Then added onion, tomato, parsley and sliced California Black Ripe Olives. While beans were cooking I made the dressing. Half an hour before you are ready to serve, toss the dressing into beans, vegetables and olives. 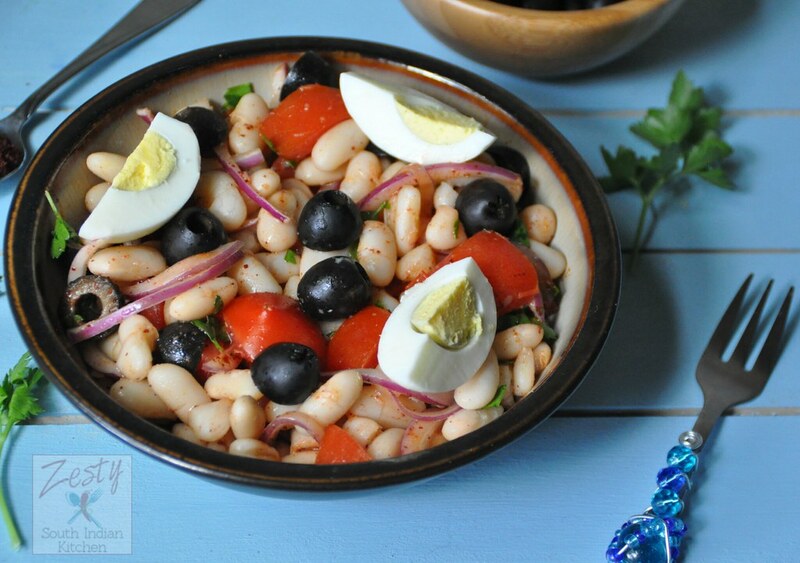 Arrange on a serving plate and garnish with the boiled halved eggs and some more black olives. Serve immediately or refrigerate until you are ready. Traditionally this salad is served along with Turkish style meatballs and pickled cucumber and peppers. You can make this salad as a great alternative for lunch, served with some nice crusty bread or in can be a part of a meze spread. If you ask me the taste, I would say tangy lemony sumac perfectly blend with spicy chili and earthy, nutty, spicy cumin dressing matched with subtle white kidney beans. 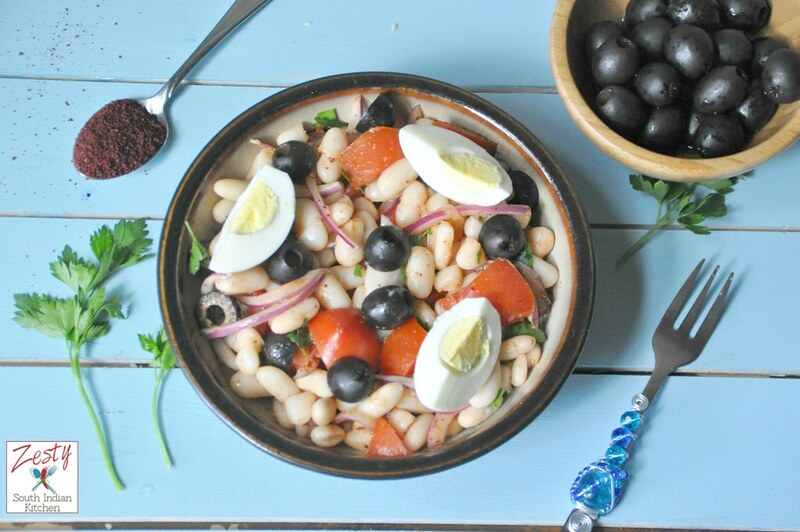 Veggies like onion, tomato and black olives played perfect counterpart in this salad. So why wait, try this delicious salad if you follow a healthy life style. Also are you into the healthy cooking and like black olives like me enter this California Ripe Olives Midsummer Mediterranean Giveaway for a chance to win a fabulous prize package, you can be the winner who can enjoy the Mediterranean feast at home. 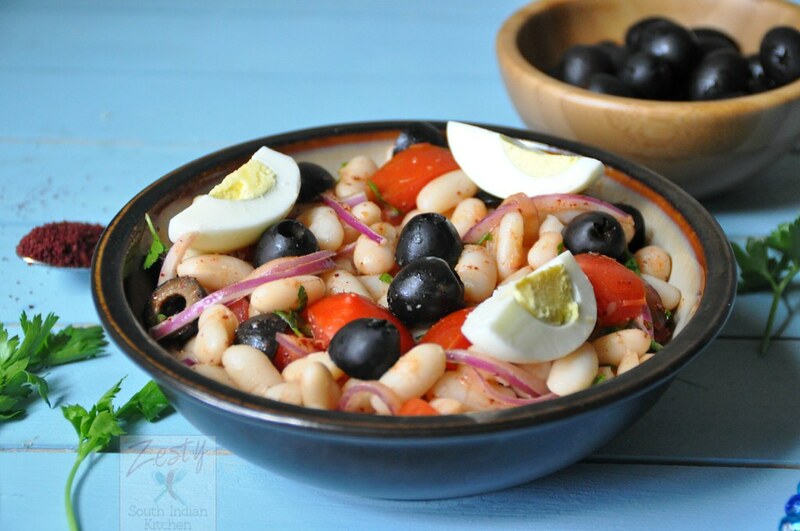 Delicious Fasulye Piyazi Turkish beans salad which healthy and protein rich.
. Add the onion, chopped tomatoes, half of the olives, parsley into the bowl. Then add cooked beans and pour dressing over this mixture. Thank you once again Swathi ….love to have a bowl of this salad…. Delicious and fresh salad..Will try this..
refreshing salad. I love it. Fresh salad is always so comforting.. and this version of yours looks so refreshing! Good one Swathi! I love the flavor of sumac and cumin in your salad, Swathi! It sounds so good! Pinning! Very healthy bean and vegetables salad. 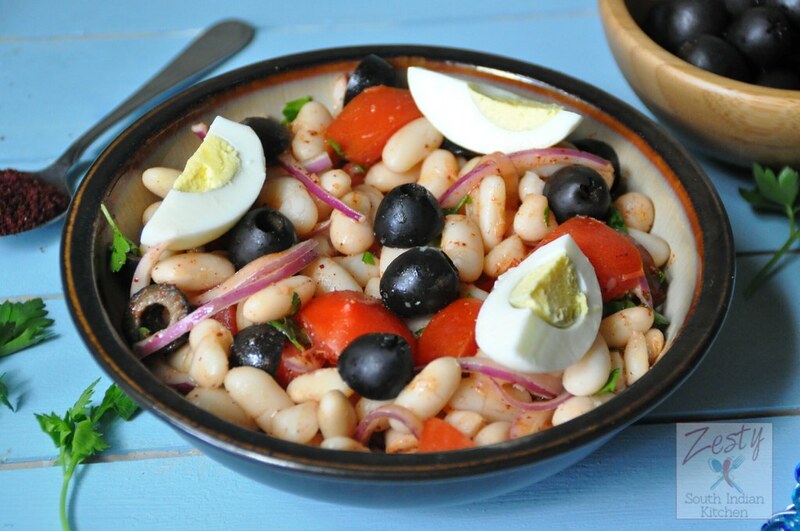 Bean salad looks so refreshing and delicious, Swathi! Healthy, delicious and beautiful too! I am loving the spiced up dressing you made! Bet that would be good on lots of things.